The Masuya International Group of restaurants is definitely not a new name to me. 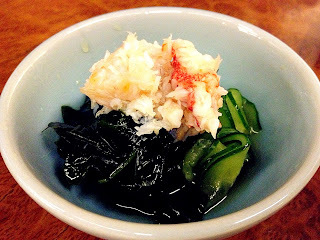 Their flagship restaurant, Masuya has been around since 1993. Though I was only little girl back then, I have since been a loyal customer. This group is also responsible for bringing to us other big names such as Makoto (an all time favourite sushi-train) and Miso (famous for their succulent and juicy pork katsu bento boxes). Recently, this group brought to us another restaurant, Toriichi. Toriichi is located at 12-14 O'Connell Street, Sydney just upstairs from Masuya. The space is long and narrow and furnished by combining modern elements with a bit of zen. A strange combination if you ask me, particularly with the black walls contrasted with white fluorescent lighting and zen displays. However despite my previous comments, I was lucky to get the best seat in the house - a table made from a 350 year old tree. The menu presented shows a combination of kobachi (tapas, as starters), deep fried options, house specials, aburi/yakitori options, oden (a Japanese mini version of what we commonly call a 'hot pot', without the flame) and sashimi. I was here with my high school girls on our once-a-month catch up and given it was a first-time here for all of us, we tried to order a good mix of food. The sake menu at Toriichi boasts variations from all around Japan. Again a week-night and although I told the group prior to dinner that there will be no drinking, I could not resist ordering just one bottle between us! The sake menu provides a Sake Meter Value (SMV) which is always very helpful. There is such a great variety of sake that it is impossible to know it all, and the SMV can assist in picking out the right one for your personal taste. 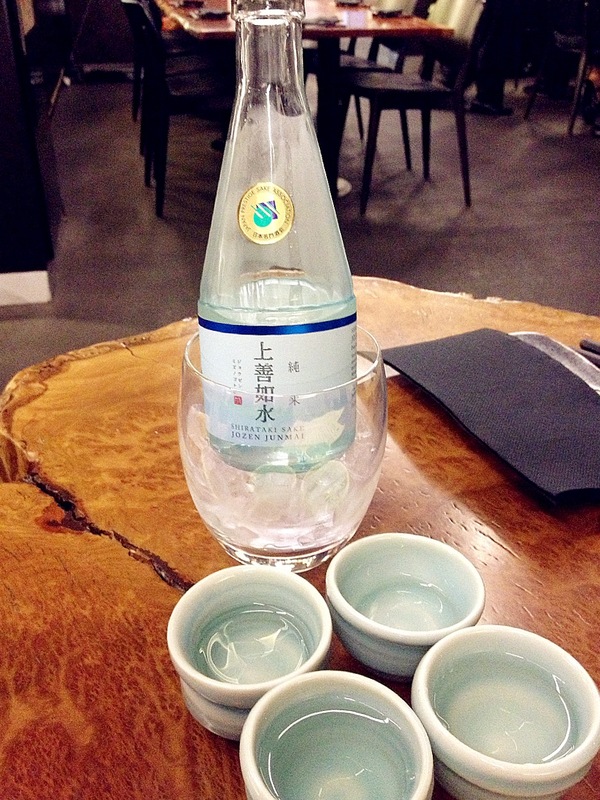 As a general rule of thumb, the higher the positive number, the drier and richer the sake. Conversely, the lower the negative number is, the sweeter and lighter the sake. I usually opt for a sake with a SMV of about +5. I must point out, although the sake menu is not extensive, it does cover a good range - from the Junmai Daiginjo-Shu (the most premium), to Junmai Ginjo-Shu, to Junmai-Shu. The first word "Junmai" is an indicator that the sake is of good quality, made with traditional techniques and using only with pure rice wine (with no added alcohol, unlike cheaper variations). We picked the Jyozen Junmai which had a SMV of +7 - Dry, full-bodied and fruity. Tick, tick and tick! 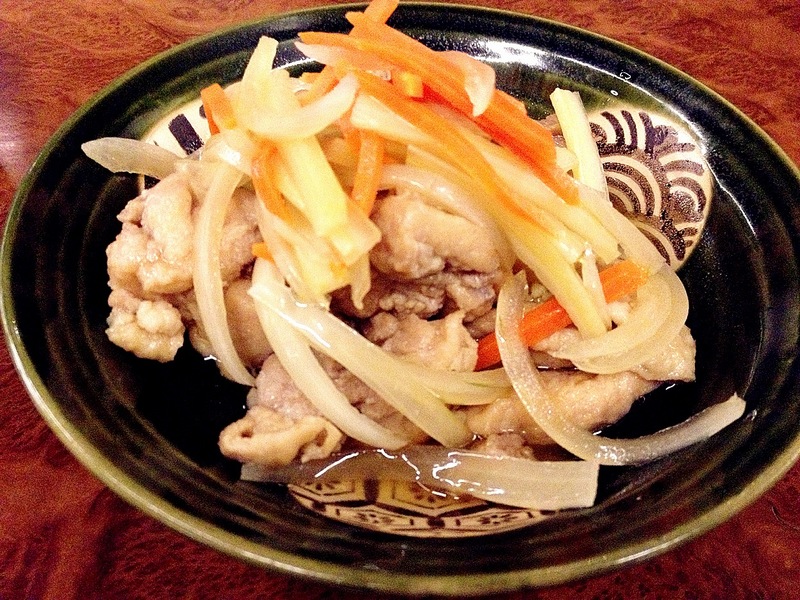 First we had the Chicken Nanban - fried chicken and onion marinated in sweetened rice wine vinegar. To be bluntly honest, I did not rate this dish. I could not see the point of serving fried chicken cold and soggy as it defeats the purpose of frying it, doesn't it? Next was the Salmon Carpaccio, served with a Japanese citrus and soy dressing. The salmon was fresh and the flavours well balanced. Next came the Ice Crab Meat and Cucumber Salad. The cucumber was lightly pickled but overall I found this dish bland and lacking in taste. Something more was needed to enhance the flavour of the crab meat. 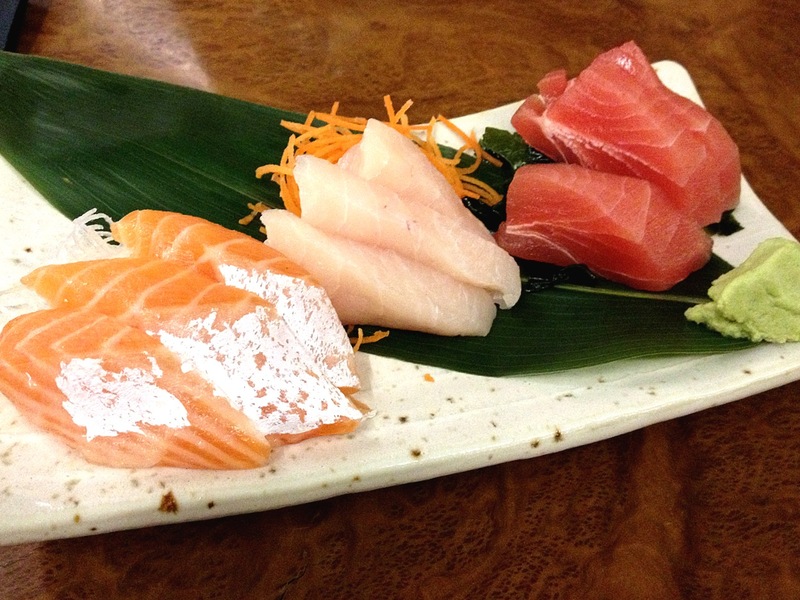 Then followed the Mixed Sashimi of salmon, tuna and swordfish. As with other Masuya Group restaurants, the fish was fresh and served in thick slices. 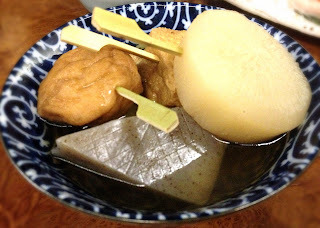 The long awaited 5 Kinds Assorted Oden was then served. A small bowl of vegetables, potato jelly, fish cakes and radish cooked in a traditional fish broth. It's something different but not something that I enjoyed as again I found it a bit bland in comparison to the other dishes. 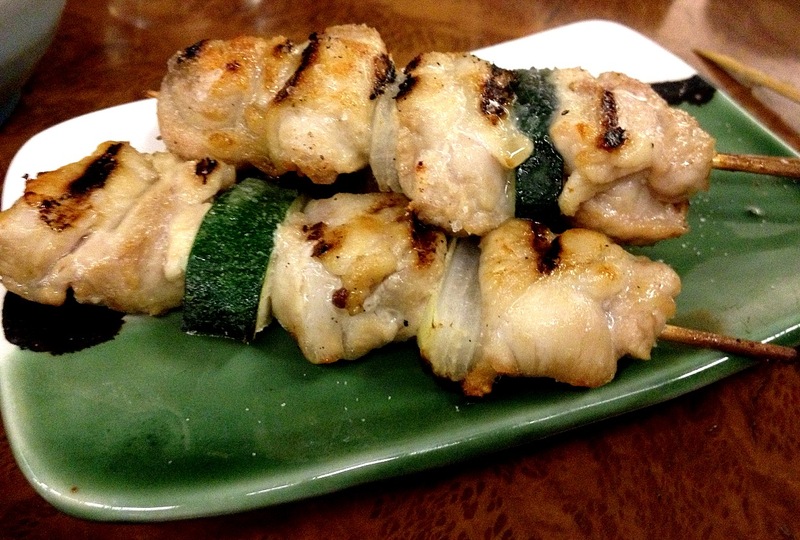 The Yakitori came next. The chicken was generously salted and very juicy. 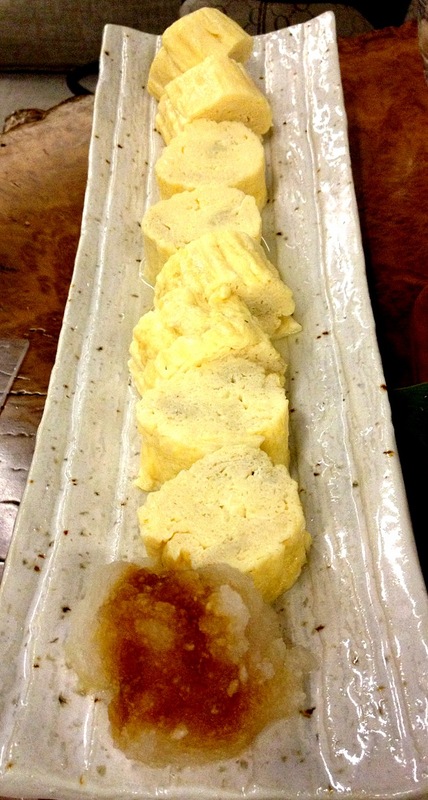 We also ordered the house special Dashimaki (more commonly known as 'Tamago'), which is simply a very thin egg omelette made in a special rectangular pan, rolled together while cooking to make a long and thick egg roll. I expected the Dashimaki to be a bit sweeter and more tasty, but also found it to be a bit too bland for my liking. Our final dish was taken from the specials menu, the Aburi Wagyu Beef. This was my favourite dish of all the hits and misses. 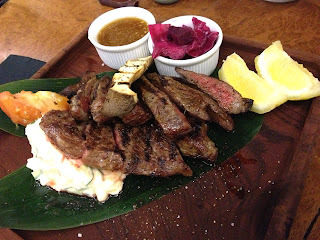 The beef was cooked evenly, not overdone, and the meat was tender and juicy. Overall, the experience was not as great as I expected from the Masuya Group and must be my least favourite. Nonetheless, their sake menu is very reasonably priced and well varied, and I am sure to be back to try them all (especially their Sake Tasting Menu - at a very attractive $20 to try 5 kinds!) - just next time I might stick with the fail-proof dishes. The ambience is casual and lazy, so bring a friend or two!